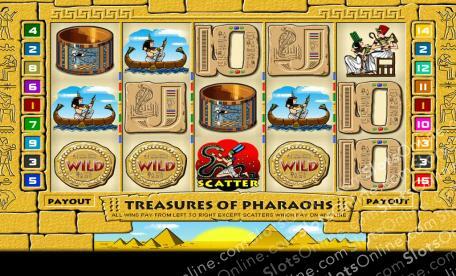 Live the life of a pharaoh in ancient Egypt on the 3 or 5 reel version of this online slot. Click here to play! If you can rule the land successfully, you'll be rewarded with valued relics and treasures beyond belief! While you're ruling your land with an iron fist, be sure to collect as many WILD coins as possible. As you might have expected, these valuable icons act as wild symbols and will replace most other symbols on the board to create winning combinations. You'll also want to oversee the modeling of the pharaoh's golden bust. Spin two to five of these symbols and you could get up to 2000 credits. Hieroglyphics are also an important part of your life as a ruler. Spin the Egyptian maiden and man and you'll get up to 500 credits. Cleopatra in the boat will get you up to 300 credits. Golden bracelets also payout up to 300 credits so do not over look these valuable ancient accessories. Watch out for the fearsome serpent. The icon featuring this creature acts as a scatter and will reward you with a number of free spins if you're lucky enough to get it on a pay line. You'll also want to keep an eye out for the jeweled beetle. This symbol will trigger a bonus game if it appears on selected reels. Pharaohs lead a life of great adventure and responsibility, are you willing to take on that role for a chance to spin in your royal treasures? The icon featuring the black serpent acts as a scatter. Three or more of these anywhere and you will be rewarded with 3, 4 or 5 free spins respectively. The Golden WILD disc acts as a wild symbol. It will replace all other symbols, excluding scatters and bonuses, to help you create more winning lines. The jeweled beetle symbol will trigger a bonus feature if they appear on reels 2, 3 and 4 in an active pay line. During this feature you will have to capture three red beetles before they disappear in order to win your prize. Each one is worth a different number of credits. Once you've captured three, the numbers will be added up to give you your bonus credits.